From what I’ve heard, a New Orleans jazz funeral is an experience like no other. 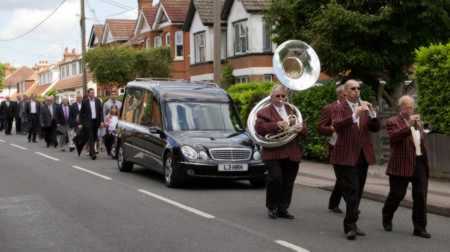 The brass band begins its solemn procession at the church, playing hymns like “Just a Closer Walk with Thee” and others – no improvisation, no frills; Nothing but sadness blown low and blue to the beat of a muted snare drum. Once the procession arrives at the cemetery, though, and after the body is lowered into the ground, the mood shifts. Brightly decorated umbrellas burst open, the snare drummer removes his mute, and the funeral procession heads back into town to the loud strains of “When the Saints Go Marching In.” Folks who hear the procession’s return know a celebration’s coming. When the procession left the widow’s home in the town of Nain that day, her son’s body lying atop the funeral bier, she wasn’t planning for a celebration. No one was. Her only son was dead. Her last living male relative was gone. It meant she was without any means of support. There was no social security, no jobs available for a woman, and no welfare program. A woman, in that first century world, with no husband, and no son to support her, would have had few choices to survive – begging on the street corner, or worse yet, prostitution. There was no expectation, no hope of celebration for the woman or the crowd that followed her. They mourned, they wept, and they made their slow way to the cemetery outside of town. As the funeral procession emerges from the city gate, they meet another crowd entering the city. A man leaves that crowd and approaches the mother. He looks at her and says, “Do not weep.” If the crowd hadn’t hushed before that, I’m sure it does when the man touches the bier, the platform, on which the woman’s son lies. And when Jesus tells the dead man to rise and he does? The text doesn’t say so, but I’m guessing that more than one or two jaws dropped. It was the second healing from Jesus on that same day. And if the healing of the centurion’s slave, at the beginning of our gospel reading is a miracle, then what do we call Jesus raising this man from the dead – A super-duper miracle? Her son comes back to life. She is saved from living on the streets. There can be no doubt that Jesus is the one sent from God to save his people. It is truly amazing. But there’s one thing about this text that, if not troubling, is at least a little confusing. There is no mention of this woman’s faith. Jesus heals a lot of people in the Gospel of Luke. A centurion sends some Jewish elders to request that Jesus heal his slave. When the centurion hears that Jesus is heading his way, he sends friends to tell Jesus, “I am not worthy to have you come under my roof…but only speak the word and let my servant be healed.” And then Jesus praises the faith of the centurion saying, “I tell you, not even in Israel have I found such faith.” And then he returns home, and the slave was healed. Did Jesus heal the slave because of the centurion’s faith? There are certainly other places in the Bible that talk about a connection between faith and healing. But the woman in today’s story doesn’t seek out Jesus. She doesn’t beg Jesus for her son’s life. All she does is cry. Of course, maybe the reason isn’t from a lack of faith, maybe she just thinks it’s too late. Her son is dead. But if that’s the case, why doesn’t she at least say “thank you?” Or if she did say “thank you,” why doesn’t the gospel writer record her response? It could be that mother and son joined in a celebration with the rest of the crowd. But why didn’t the gospel writer tell us that? In other stories in Luke, people’s healing is attributed to their faith. Or if the healing happens without a request for it, like crippled woman later in Luke’s gospel, they at least say thank you or begin praising God. But in this story of Jesus raising this man from the dead, there is no word about the mother’s faith. All we are told about is her tears. So, maybe this story isn’t about faith. Maybe this story is about grace-pure, unearned, un-asked-for grace. This raising doesn’t happen because of a mother’s faith or her son’s worthiness. It happens because Jesus has compassion for her. Period. It could be that both mother and son were faithful and grateful. But the point of this story is not the mother or her son. The point of this story is Jesus’ compassion. The point is that when grace comes into our lives, it often comes in a way that surprises us. The point, the application for us, is that we should always be packing party clothes because, with Jesus, you never know when a funeral procession just might turn into a celebration. Years ago, I did a funeral for a man by the name of Manny. Manny was a jazz pianist who, with his music, had brought joy to the lives of many people. One of his last gigs was playing piano at a restaurant in Bemidji for the supper crowd. He would take requests. Manny could play anything. It was something to behold. Manny’s funeral packed the church. In planning his funeral, his wife asked if we could have a jazz quartet to provide the music for the service. And then she asked if it would be OK, if Manny’s casket could be led out of the church with the band playing an enthusiastic rendition of “When the Saints go Marching In” – just like they do it in New Orleans, she said. And she wondered if I would play my trumpet and lead the parade out the church. At the end of the service, I told the congregation what his wife had requested. “She wanted us to go out of the church rejoicing, singing, and having a celebration,” I said. The snare drum let out with a loud riff. And then the rest of the quartet joined in. And I took my trumpet and began to play “When the Saints,” and the congregation joined in the singing. Tears flowed down the face of Manny’s wife and a broad smile showed on her face. She was grieving, yes, but she was also rejoicing in the promise of Manny’s resurrection. By the time we got to the refrain, singing, “O Lord, I want to be in that number, when the Saints go marching in,” I think many of us felt that we were in that number … Well, most of us. The next day, I overheard a couple of people talking about the unconventional funeral in critical, “well, I never,” kind of words, wondering out loud if it was appropriate. Manny’s funeral, and the comments of those couple of people, taught me a lot about grace. Grace, and it’s close cousin Blessing, often comes un-asked-for. It may not come the day of a funeral, as it did that day at Manny’s funeral. But it comes. And sometimes, we may not be ready for it. And that brings us to one final point in this story of the raising of the widow’s son, Maybe the point of the story is to get us to think about how we might respond. Maybe the response of the widow and her son is left out to get us to think about those moments when we are recipients of unexpected good news, or an unexpected blessing. How will we respond to God’s grace in our lives? Will we complain with our arms crossed and our teeth clenched and say, “Well, I never…” or will we celebrate with our voices and hearts wide open? What we see in Jesus, is that our God who created us, has now sent his Son to redeem us, and to sustain us, and is with us always, working in us wholeness and new life. Our job is to keep our eyes, ears, and hearts open for signs of his Amazing Grace breaking into our lives, and when we perceive it and recognize it, to give thanks and praise to God, and to move a little closer to living every day as grateful people, loving and serving our gracious God and entrusting our lives to him.